When the election committee met in 1859, Henry Creagh stated that he was a printer and elector, printing bills for both parties. His bill for £6 16s 6d for printing costs for Mr Astell had been given to Mr Caunter–it had not yet been paid. The 1861 census shows a 71 year old Henry C Creagh, a Surveyor of roads, living at West End, Ashburton. 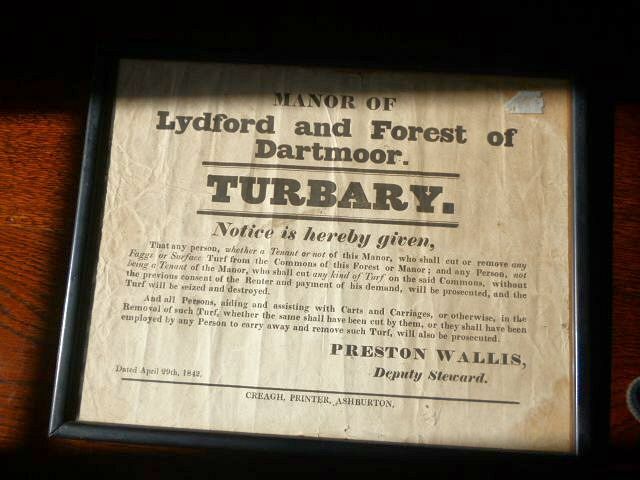 At other times he describes himself as an auctioneer or land-surveyor, and in 1838 appears in conjunction with John Whiteway valuing the tithe apportionment of Woodland. In 1870 Morris and Co's Commercial Directory and Gazetteer describes Henry Couch Creagh as a printer in Ashburton. He died aged 87 in 1878, and was buried on January 28th. Many thanks to Roger Collicott of Roger Collicott Books, Moretonhampstead for this picture. 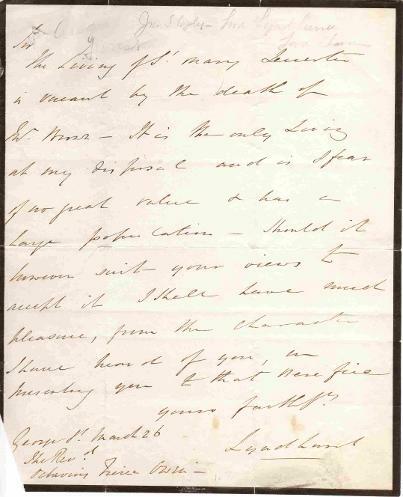 This letter, written from Lyndhurst's home in George Street, London, on mourning stationery, offers a living at St Mary's Leicester,to a Reverend Owen. The names are difficult to decipher, but the letter basically goes as follows: 'The living of St. Mary Leicester is vacant by the death of W(?) ...?... – it is the only living at my disposal and is, I fear of no great value and has a large population. Should it however suit your views to accept it I shall have much pleasure, from the character I have heard of you, in inviting you to that benefice. Yours faithfully, Lyndhurst. In April 1846, under Church Preferments, the Morning Post announced that the Rev. Octavius Freire Owen had been appointed to the Vicarage of St Mary, Leicester. The vacancy occurred through the death of the Rev. J. Brown. For more on Lord Lyndhurst, see Election fever in the Gathering together section.